That does look like a very cute book! Those are some of my favorite critters! 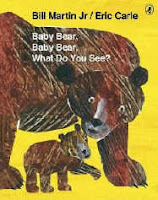 Eric Carle is great. Congrats on your two books. Hey!!!! Isn't Eric Carle the same guy who wrote "The Very Hungry Caterpillar"? Oh, all those wonderful memories! We caught some bear cubs with our trail camera. (which takes photos when an animal walks by) So they might just see a camera when they're out in the wild.